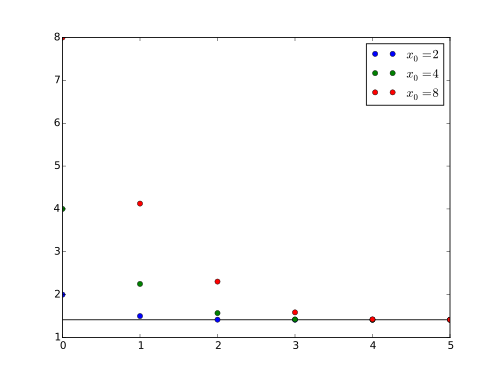 The yield statement is used to define generators in Python. So before we get into what exactly yield does, we have to understand the concept of generators first. Generators have a significant role in Python and if you’re deep into Python programming, then chances are you have already worked with Python generators. Generators are used to create iterators in Python, but with a different approach. A Python Generators are functions that produce a sequence of results and can be paused and resumed dynamically. Generators were first added as an optional feature in Python 2.2 and made standard in Python 2.3. Although, they were powerful enough, the generators functions were significantly enhanced in Python 2.5. When generators were added back in Python 2.2, it introduced a new keyword “yield” for backward compatibility, for which we needed to import generators from the _future_ module in order to use them. This was changed in the Python version 2.3 when generators became standard and it was no longer necessary. The yield statement suspends execution of a function and sends a value back to caller, while saving state and later resuming meaning the whole generator itself can still be resumed after the return value is obtained. A return statement ends the execution of the function and sends a value back to the caller. Without it, your function returns nothing. Let’s take a good look at when to use yield and when to use return in Python to better understand the difference between the two. The yield statement is used in Python generators to replace the return of a function to send a value back to its caller without destroying local variables. To better understand what role the yield statement plays in Python programming, you have to understand what generators are. Generator functions are produced by definition just like regular functions but contain a “yield” statement. This begins with the keyword “yield” which specifies the generator object to be returned to the caller. A generator is a special function in Python that returns a generator object to the caller rather than a data value. The yield keyword has the unique capability of stopping execution of the function, saving state, and later resuming. The return statement, unlike the yield statement, exits from a function, handing back a value to its caller. Functions return a value back to their callers and those that are more procedural in nature do not explicitly return anything at all. While a function can have multiple return statements, only one of them can be called for any given invocation of the function. Typically, a return statement appears at the very end of a function block to return the final result of executing all statements contained in that function. However, it may also appear earlier in the function block to stop execution of all subsequent statements in that block. This immediately resumes the execution of the program at the caller. 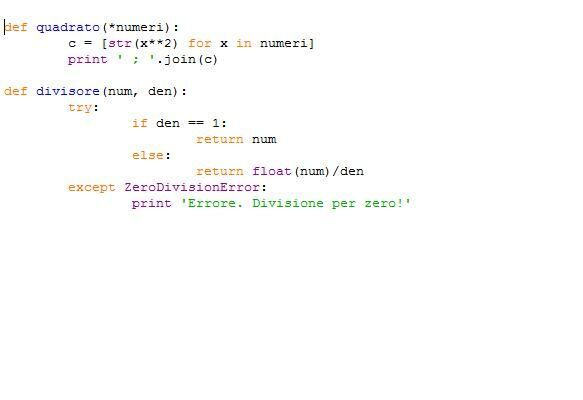 When no value is specified, the equivalent return object type in Python is “None”. The yield statement is used in Python generators to replace the return of a function to send a value back to its caller without destroying local variables. A generator is a special function in Python that returns a generator object to the caller rather than a data value. The return statement, unlike the yield statement, exits from a function, handing back a value to its caller. Typically, a return statement appears at the very end of a function block to return the final result of executing all statements contained in that function. All functions return a value and if there is no value specified, it will return “None”. The yield statement is explicitly used with Python generators. Syntactically, a generator is a function with a yield statement. While a function can have multiple return statements, only one of them can be called for any given invocation of the function. Unlike a function which only returns once, generators can halt execution and yield intermediate results. Each generator is defined as a function, but instead of the return keyword, yield keyword is used inside the function block to indicate that the return value is only temporary and the whole generator can be resumed even after the return value is obtained. The return statement terminates the execution of a function and sends back a value to its caller. Functions return a value back to their callers and those that are more procedural in nature do not explicitly return anything at all. What is basically does is take exit from a function and destroy all the local values within. The yield statement, on the other hand, replaces the return value of a function to suspend its execution and sends value back to its caller without destroying local variables. However, unlike the return function, yield resumes the execution of the function from where it was left off. Syntactically, yield is a keyword which can be used just like the return keyword, except the return statement terminates the execution of your function and sends back a value to its caller. The functionality of the return statement is to take inputs and return something to the caller. Unlike a return, yield statement is explicitly used to define generators, replacing the return value of a function to suspend its execution keeping the local variables intact, whereas the return statement destroys all the local variables within. Sagar Khillar. "Difference Between Python Yield and Python Return." DifferenceBetween.net. 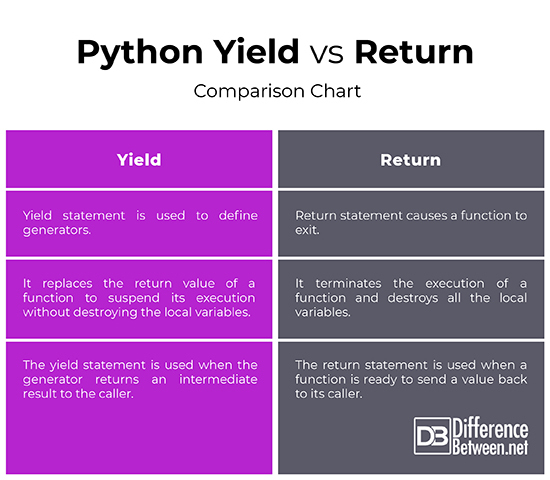 January 10, 2019 < http://www.differencebetween.net/technology/difference-between-python-yield-and-python-return/ >.